Considering cutting corners to reduce your tax bill? Tax fraud comes with harsh consequences and you’ll want to avoid these common lies. Considering cutting corners to reduce your tax bill? Sounds appealing if you're lucky enough to fly under the radar, but tax fraud comes with harsh consequences if the folks at Uncle Sam's headquarters track you down. Sure, only 0.84% of all returns were audited in 2015, notes Kiplinger. However, the IRS also launched 1,202 criminal investigations in 2015, and 78.4 % of those individuals were incarcerated for an average of 30 months, according to their website. Is this something that you're willing to risk? If you want to avoid mistakes that can cost you much more than you'll ever save, this list is for you. If you have children (or other people that depend on you), you know about this one. Claiming additional dependents results in lucrative benefits. For starters, the more dependents you have, the more dependency exemptions you can claim on your return. And if your taxable income is on the lower end of the spectrum, you may also qualify for the child tax credit and a larger earned income credit. Unfortunately, many don't realize that the IRS automatically rejects returns that list dependents who've already been claimed. And if you bypass the initial screening but are selected for an audit, the IRS will ask you to provide proof of support and residency. A better option: use the Interactive Tax Assistant to determine if the individual in question qualifies as a dependent. Side jobs, contracting work, freelancing and part-time jobs are great ways to earn extra income. But don't forget about them come tax time. Miscellaneous income generated throughout the year can be found on Form 1099. These forms are supposed to be sent out by January 31 by the people you've worked for. But they could arrive much later if the preparer is running behind schedule. Form 1099s are also sent to the IRS by the end of February and will trigger an error if the amount you report is lower than what they have on file. (Overstatements generally aren't an issue). If your Form 1099 contains errors, contact the payer promptly to have it rectified before it is sent to the IRS. And if you just forget about it, or don't think it's important to disclose, you're putting yourself at risk for an audit. In other words: Report all 1099 income! Like the Form 1099, you should receive all W2 forms from your employers by the end of January. Employers must submit them to the IRS by the end of February. Your W2's contains the amount you've earned, taxes you've paid, and other important details. When you submit your return, the IRS will compare the amounts on your W2 to what you claimed on your 1040. If there are major discrepancies, an audit could be headed your way. There's nothing wrong with being generous when you can afford to. In fact, not only are you helping someone else, you're reducing your tax bill. However, the contributions should be proportionate to your income. For example, if your annual income is $35,000, the IRS may find it hard to believe that you donated $10,000 to charity. The deduction taken for items donated to charity should also be realistic. Simply put, don't take a 20-year-old couch to the Goodwill and claim a $2,000 deduction for it. This one can be tricky – especially if you like games of chance, fantasy football, horse racing, etc. And if you don't usually gamble, but went to Las Vegas and won at the slots, this is for you. Gambling winnings that exceed $1,200 are reported to the IRS on Form W-2G and should also be reported on your 1040. In other words, the IRS will get a report of your winnings – and if you don't report them, you could get a call. Here's a simple solution: Keep a log of your winnings and losses so you won't have to play the guessing game when it's time to file your return. See IRS Topic 419 to learn more. Do you work in a service industry and are paid partly by tips? Were you paid cash in exchange for services rendered at your place of employment? 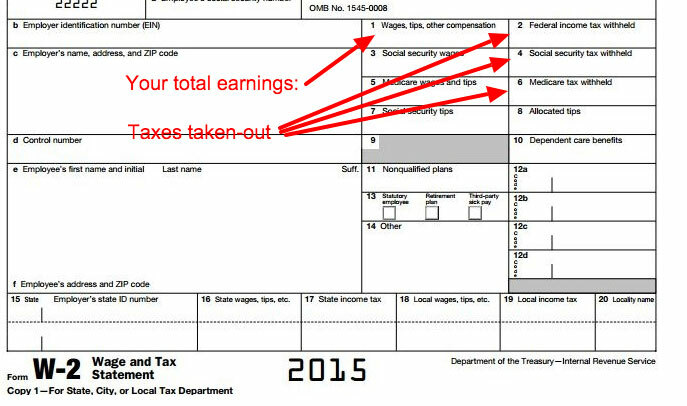 If so, you must report these earnings on your tax return. Be mindful that the IRS has minimum earning thresholds that they expect you to meet. If you earn more than the minimum but don't report the income, you increase your audit risk. Claiming dependents is one way to reduce your tax bill. Another is by overstating business expenses. Yes, if you own your own business (and depending on how the business is set-up), you can and should deduct your expenses. However&hellips; if you're tempted to write off that family vacation or lavish dinner as a business expense – ask yourself if it's really worth it. Adequate documentation is needed to substantiate your claims. And they have to have legitimate business uses. Need help determining business expenses? Our business calculators can help. Here's another one from business owners. The good news. If you conduct business from your home office, you may be eligible to take the home office deduction. But. There must be a portion of your home dedicated to business operations or you may find yourself in the IRS hot seat. For example, is you have an office that's also the media room, it can't be deducted. Refrain from classifying a large percentage of your home as office space or you will raise eyebrows at Uncle Sam's headquarters. See IRS Publication 587 to determine if your home office qualifies. Driving because you have to is part of many jobs. Because of this, the miles driven for work in your personal vehicle can be deducted. After all, you are working. The standard mileage rate is 54 cents per mile for business miles driven, notes the IRS' website. You definitely don't want to leave that deduction on the table if you frequently use your car for business.But there is a fine line between business and personal mileage. To confirm the validity of your mileage deduction, you will need to keep a detailed mileage log. This should include the date of the trip and business purpose, starting point, ending point and total number of miles. If you're heading to a business meeting but planning to make several personal stops along the way, you may want to leave that trip off the log. If you are ever audited, this could result in a substantial penalty. If you are a self-employed business owner, the IRS won't be alarmed if you deduct business expenses. However, they expect you to report the actual amount of the expense. Rounded numbers, such as $1,500, for $1,172 worth of expenses, might make life simple for you, but it's a red flag for them. When they see these, the IRS may suspect that you are fabricating expenses to reduce your income. Has your business reported a loss for more than three of the last five years? We know businesses aren't always profitable. Some years are good, some are not. And if the business is new? Things can be even worse. But that business still spends money – and deducts these expenses. If your business has reported losses from more than three of the last five years, the IRS may be inclined to take a closer look at your books.They will want to confirm your business is legit, and not an expensive hobby. If it's just a hobby, or an excuse for paying less taxes… you may face a hefty penalty. Both you and the tax preparer may be subject to criminal penalties and face disciplinary actions if the IRS determines you've engaged in tax fraud. The IRS will also come after you for penalties and interest on your outstanding tax obligation. Even worse, they may decide to journey back into time and review prior tax returns to ensure you didn't cut corners on those as well. Bottom line:The money you'll save by committing tax fraud is not worth the consequences and embarrassment you'll face if the IRS catches you. Know someone who needs to read this? Share it!